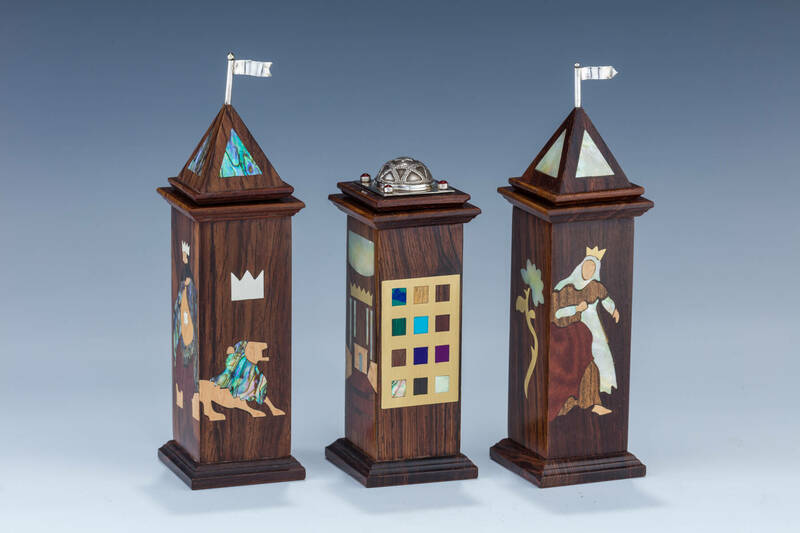 Brooklyn, New York;Three Inlaid Spice Boxes, Artist’s collection. Beit Hamikdash, the Second Temple, a King and a Queen. These are some of the images inlaid to create the miniature spice boxes. Swiveling flags and granulated domes at the top are all made of sterling silver. The other panels show images of the Choshen and its twelve stones, the Lion of Judah and a flower. The set is made of exotic woods, shells and stones. Set is inspired by the artists’ magnificent chess set. Two are 7” tall and one is 5.2”.